This week's discoveries: Kepler is alive again, and uses microlensing! “People scratch their heads about microlensing. This will show the power of the technique, get people excited and involved,” said NASA’s astronomer Calen Henderson in this week’s Science. 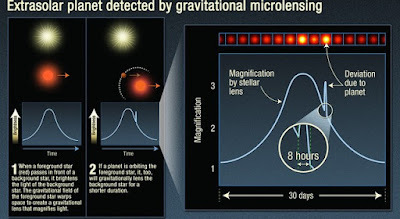 But what is microlensing exactly? And how can Kepler use it? source behind the star in the middle. The ‘gravity pit’ of the star has bent the light. What is this microlensing you’re talking about? 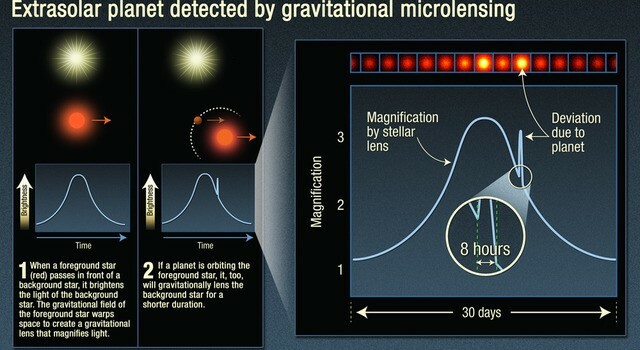 Microlensing is, like many cool things in physics, a phenomena caused by Einstein’s theory of general relativity. This theory states that mass curves space time, like a heavy rock curves a rubber sheet. This is the reason why, for example, planets orbit stars; they are ‘trapped’ in the ‘pit’ the star made in space-time, like a marble which rolls over the rubber sheet will orbit the rock too, if it has the right speed. But a funny thing is, light is also affected by this ‘pit’ in space-time. Because light is incredibly fast, it doesn’t get trapped in the pit, but it changes direction if it passes a heavy object, like a marble which rolls really fast past the rock. 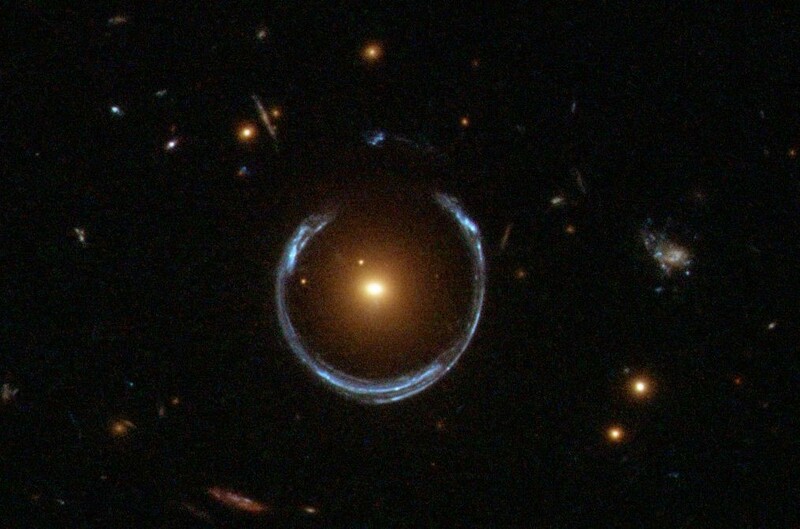 Since light also changes direction if it travels through a lens, this is called gravitational lensing. This effect is of course bigger when the object which acts as a lens, the rock, is heavier, if it’s for example a whole galaxy, because the light gets bent more then. But it is also detectable on a much smaller scale, like with a star acting as lens, or even a planet. This is called microlensing, and that’s exactly what Kepler is going to use. But what’s Kepler currently doing? Kepler is a space probe that orbits the sun and searches for planets that orbit other stars. It has already discovered many planets using a method called the transit method. This method uses the fact that a planets throws a little shadow on its star as it passes in front of it. This causes a slight decrease in the brightness of the star. Kepler can detect this and then deduce the size, mass and other things of the planet. Kepler has already discovered many planets using the transit method, but there’s a problem. With the transit method, Kepler can’t detect planets which are really far away from their star or planets that don’t orbit a star at all. This is where microlensing comes into play. So Kepler can use microlensing too? The effect of microlensing is so small that a ring, like in the picture, doesn’t appear. A star or planet simply can’t bent the light that much. Instead, the star behind the ‘lens’ appears brighter. If a star that has an orbiting planet moves in front of another star that is really far away, the far-away star will become brighter, because the light gets bended by the star’s gravity. But if the planet also moves in front of the far-away star, the planet also bends the light a little, making the far-away star even brighter. This method is harder to use than the transit method, because it also requires telescopes on earth working together with Kepler. A planet passing in front of its star also happens way more often than a star with a planet passing in front of a far-away star. Kepler will probably discover way less planets with microlensing than it did with the transit method. But microlensing can discover planets that the transit method can’t. Planets that don’t orbit a star can be found with microlensing, but not with the transit method, for example. The reason for this is very simple. You can’t throw a shadow on your star if you don’t have one. Kepler also has trouble detecting planets that orbit their stars very slowly, since the planets won’t pass in front of their star very often and a pattern would be difficult to find. Mircolensing doesn’t have these kinds of problems so it is a great method for discovering planets we couldn’t detect before. This means we can find out even more about the universe! Click here to read more astronomy posts!